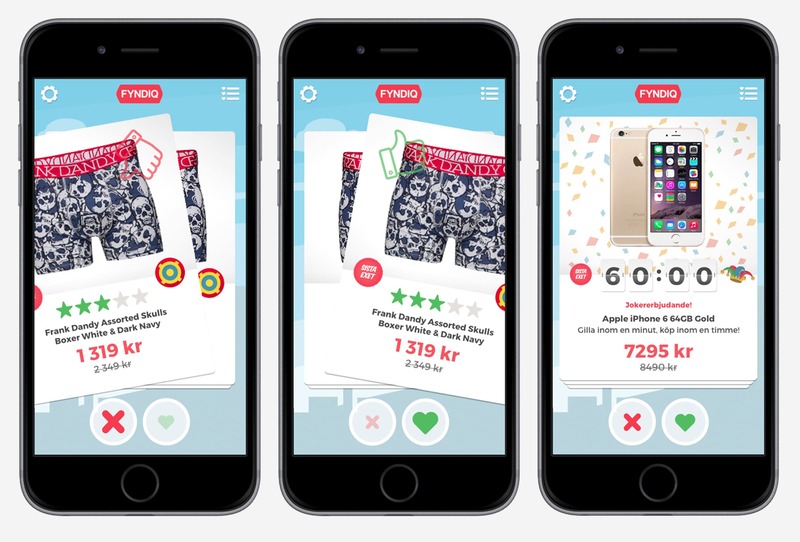 Fyndiq, established as one of the largest online retailers in Sweden, hired us to help them create an intuitive companion app offering special discounts. With gamification being a huge thing; we created Tinder for shopping. To better target the younger generation heavily invested in their smartphones, Fyndiq released their newly built mobile site. To help with promoting this we were hired to create a companion app that could help boosting the sales of exceptionally price-worthy items, instantly available through the phone customers were carrying with them at all time. A lot people are dating today, and if you belong to the percentage that doesn't date you've still heard of at least one dating app. With a simple swiping animation you have a chance of matching with likeminded people. It doesn't take up much time for the user and you can quickly speed through a lot of people you might find interesting. Fyndiq has a lot of products in its online directory and thus there is a very low chance that the normal user is able to see all of them. By taking a different approach than simply listing the products by category we implemented the same idea the dating apps were using, to display the most attractive products and let the customer decide whether or not they like them. The user would either save or discard the product that is displayed on the screen, and saved products would end up in a list labeled favourites which could easily be purchased at a later time. One unique part of the app experience is the Joker Deal. In essence, this is a deal that appears at random while swiping through normal discounted deals, but with the addition that you need to act on the deal within a certain timeframe (one hour) and the timer starts when you swipe right. If you fail to purchase the item within the hour, the opportunity is lost. This function was created to add unique content to the Fyndiq experience and get user to return back to the app. We now have a reason to send out notifications to the user, and make them routinely check the app. We learned a lot about the harmony in tools that both developers and designers would use, and being inspired by a concept like the various dating apps out there were a lot of user experience challenges incorporating categories and lists that had to be integrated seamlessly. A side-project was the work put down on animations, where we had to carefully coordinate with the developers to make sure the end result matched what the client and designers wished it to be.